Offering you a complete choice of products which include hot strip rolling mills. We are proud to present ourselves as an eminent enterprise for turnkey installation of Hot Strip Mills. 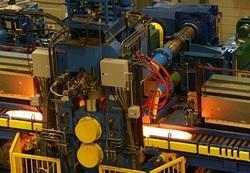 The Strip Mills are employed to Hot Rolled Coils upto 1250 width. We have several successful installations globally to our name with addition to this possess a team of highly skilled and competent engineers to execute all genus of green-field or brown-field Hot Strip Mill projects. The proficiency and economy of our machines falling under this segment has made us a vast name in Rolling Mill Industry. Jatindra Engineering Corporation can offer different tailor made solutions that can be split in three main categories, narrow-width, medium and wider strip mills. Based on the coil set-up and required yearly capacity we offer the reliable mill configuration in: continuous and semi-continuous modes. Customization of flats & strips. Execution of projects according to the requirement of the clients. Finest quality of products and at highly competitive prices. Timely delivery of plant and machinery to clients.